Confucians the world over can relax. His moral integrity is intact. From the set of a new biopic being shot in Zhuozhou, Hebei province, comes word that the great thinker will neither be shown embroiled in sexual encounters nor gravity-defying kungfu. The $20 million project has created quite a stir, especially among enraged Confucius followers, amid rumors that the man regarded in China as a saint would be portrayed in a less-than-perfect light. Fifty Confucian academic associations even wrote to director Hu Mei last month, urging her not to debase the man whose teachings have profoundly influenced Chinese culture for thousands of years. "Confucius has no love affairs or kungfu scenes," Hu assured China Daily from the set. She had just completed one particular scene in which Confucius is shown visiting Nan Zi, a well-known beauty, albeit with a reputation for being a "loose woman". 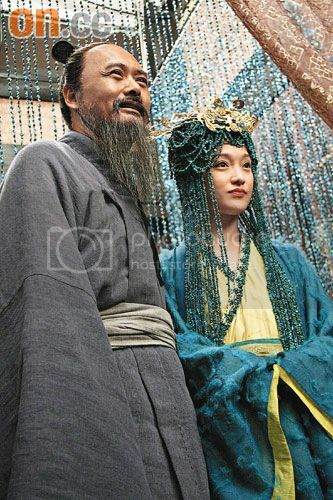 Wearing lavish headgear made of turquoise and gold, Nan Zi (mainland actress Zhou Xun) is seen walking slowly around Confucius (Chow Yuen-fat), who respectfullykneels on the floor of her sitting room in a ragged gown. Nan Zi asks Confucius for the meaning of a love poem in The Classic Book of Poetry and how much of the book was about love between men and women. Trying hard not to make eye contact, Confucius replies: "In short, the poems are from sincere thoughts." Some historical books reveal that Confucius did, indeed, visit Nan Zi but there has never been a reliable account of what happened. According to Sima Qian's Records of the Grand Historian, one of Confucius' students, Zi Lu, felt unhappy that his mentor had even associated with such a notorious woman, but Confucius told him: "If I had done anything immoral, heaven would punish me!" The Nan Zi scene is the reason many Confucius fans fear the film will be melodramatic and taint his image. Hu says there is no need to worry. "Confucius is a man who appreciates women as other men do," she says, "but the relationship between the two is respect and appreciation." Zhou Xun agrees. "She just appreciates his wisdom and is learning from him," she says. Confucius is shown as a man with diverse skills ... but not including martial arts. "Historical documents show that Confucius advocates the Six Arts, including driving a wagon and archery," Hu says. "In the film he is both a good driver and archer, but there won't be fancy kungfu scenes." Does Hu not worry that without dazzling kungfu and romance her movie will have lost its two main draw cards? "Confucius is not nobody," she says. "He is a thinker, educator and ambitious statesman whose colorful life has thrilling ups and downs. They are more than enough." Chow had four experts show him how to walk, talk and behave like an ancient scholar. The Hong Kong actor said the ancient Chinese is the most difficult part and he had lost 10 pounds since the filming started in March. The impish star jokingly said he knew nothing about Confucius and had done no research because "the director will teach me what to do". However, Hu and other cast members claimed that he recited his lines fluently at every take and often raised detailed questions. The 120-minute film follows the sacred philosopher's life from middle age to death and is expected to finish shooting by the end of the year. Confucius' doctrine, which calls for compassion, virtue, ritual and harmony, has been enjoying a revival in China, having been banned during the "cultural revolution" (1966-76). The Chinese government names those public institutes overseas that promote Chinese language and culture after him. There are now more than 300 Confucius Institutes around the world. Professor Yu Dan gained overnight fame after giving a series of TV lectures on Confucius. In the Opening Ceremony of the Beijing Olympics, thousands of actors dressed as ancient students recited excerpts from The Analects, a book recording Confucius' teachings. A reputation stretching back 2,500 years is, it seems, safe after all.